Delivering a landmark ruling, the Supreme Court on Monday held that seeking votes in the name of religion, caste or community amounted to corrupt practice and election of a candidate who indulged in it can be set aside. A seven judge constitution bench of the court headed by Chief Justice T S Thakur passed the ruling by a 4:3 majority. The bench was interpreting section 123(3) of the Representation of Peoples Act. The Supreme Court in Gopal and Sons(HUF) vs. CIT Kolkata-XI held that even if a Hindu Undivided Family (HUF) itself is not a registered shareholder, the provisions of deemed dividend are attracted once the payment is received by the HUF, and shareholder is a member of the said HUF and has substantial interest in it. A seven-judge Constitution Bench of the Supreme Court in Krishna Kumar Singh vs. State of Bihar held that re-promulgation of ordinances is a fraud on the Constitution and a subversion of democratic legislative processes. The court also held that the satisfaction of the President under Article 123 and of the Governor under Article 213 while issuing ordinances is not immune from judicial review. The Supreme Court in Harjas Rai Makhijavs..Pushparani Jain, held that a mere concealment of material facts or non-disclosure, without intent to deceive or a bald allegation of fraud without proof and intent to deceive, would not render a decree obtained by a party as fraudulent. The Supreme Court on Friday ruled that the result of adjudication cannot be announced without the judgment available on record. A two-judge bench comprising Justice Dipak Misra and Justice Amitava Roy held that the non-availability of judgment can never be a judgment because there is no declaration by way of pronouncement in the open court that the accused has been convicted or acquitted. A High Court cannot initiate contempt proceedings or punish for contempt of the Supreme Court, the apex court held in an important pronouncement on Monday in Vitusah Oberoi vs Court of Its Own Motion. A Bench headed by Chief Justice of India TS Thakur set aside an order of division bench of Delhi High Court, which found editors and cartoonists of Mid-Day newspaper guilty of contempt for maligning the former Chief Justice of India. The High court had suo motu initiated contempt after an advocate brought such cartoons and news reports to its notice. The Supreme Court, in Behram Tejani vs. Azeem Jagani,reiterated that a person holding the premises gratuitously or in the capacity as a caretaker or a servant would not acquire any right or interest on the property and even long possession in that capacity would be of no legal consequences. 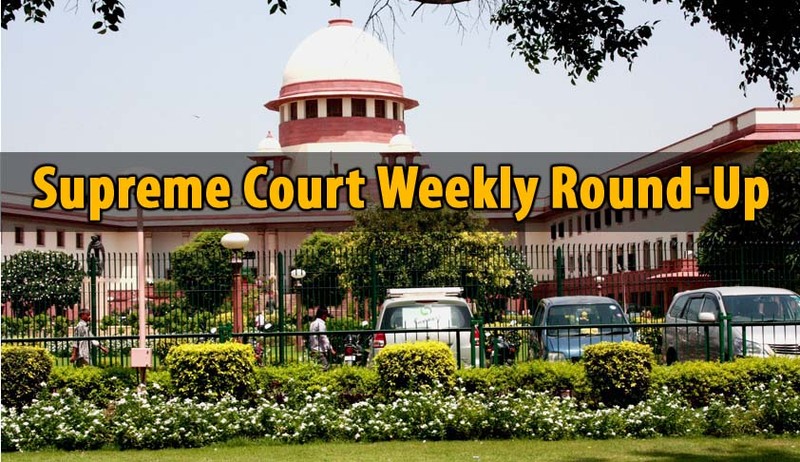 The Supreme Court in Allahabad Bank vs. Krishna Narayan Tewari, held that a high court can interfere with disciplinary enquiry if the enquiry itself is flawed, unsupported by any evidence and is conducted in violation of principles of natural justice. A bench headed by Justice Ranjan Gogoi of the Supreme Court on Friday dropped the contempt proceedings against former Supreme Court judge Justice Markandeya Katju pertaining to certain blogs he had written against the bench in sensational Soumya case after accepting his unconditional apology. The Supreme Court in State of Telangana vs. Habib Abdullah Jeelani & Ors. held that a high court, while refusing to exercise inherent powers under Section 482 of the Code of Criminal Procedure to interfere in an application for quashment of the investigation, cannot restrain the investigating agencies from arresting the accused during the course of investigation. Directing the Central government to review minimum wages to the porters so that they are paid wages at par at the lowest pay-scale applicable to multi-tasking staff, the Supreme Court in Yash Pal v. Union of India, observed that they provide valuable support to the Indian Army and are an integral, if not indispensable, requirement of operations in the border areas. The Supreme Court, in Gautam Jain vs. Union of India, reiterated that if detention order under the Conservation of Foreign Exchange and Prevention of Smuggling Activities (COFEPOSA) Act, 1974, is based on more than one grounds independent of each other, then the detention order will still survive even if one of the grounds found is non-existing or legally unsustainable. The Supreme Court in Imtiyaz Ahmad vs. State of UP,ruled that the required judge strength of the district judiciary shall be computed for each state in accordance with the interim approach suggested by the National Court Management Systems Committee (NCMSC). The Supreme Court, in M/S Patel Brothers vs. State of Assam, held that the provisions of Section 5 of the Limitation Act, 1963, are not applicable in respect of revision petitions filed in the high court under Section 81 of the Assam Value Added Tax Act, 2003. The Supreme Court asked the Election Commission of India to ‘bring on record’ the approximate time within which the entire system of the Voter-Verified Paper Audit Trail (VVPAT) can be introduced. Two months after asking the RBI why names of 57 borrowers who have defaulted on bank loans worth a whopping Rs 85,000 should not be made public, the Supreme Court on Tuesday sought data from the centre on recovery cases filed by banks and financial institutions which are pending for the last one decade. Data collection by private agencies is not a good idea, the Supreme Court on Thursday observed while refusing to expedite the hearing of Aadhaar cases challenging the constitutional validity of the scheme. The observation was made by Chief Justice J S Khehar after senior advocate Shyam Divan sought urgent hearing of the plea citing privacy concern. The Supreme Court in Centre for Public Interest Litigation Vs. Housing and Urban Development Corporation & others raised specific queries to the Central government with regard to strengthening of infrastructure to speed up retrieval of loans. The bench headed by Chief Justice of India TS Thakur has also sought from the Centre a list of corporate entities, where the debt amount outstanding is in excess of Rs.500 crore. In order to enforce the presence of the accused in Aircel-Maxis deal case, the Supreme Court proposed to restrain earning of any revenue by using the 2G spectrum licences, which were originally granted to Aircel Telecommunications. A three-judge bench of the apex court also stayed selling and trading in 2G spectrum. The Apex Court imposed a cost of Rs. 1 lakh on a tenant who refused to hand over possession to the landlord even after the apex court ordered it in 2012. The Chief Secretary and Director General of Police of Uttar Pradesh courted trouble for not executing a non-bailable warrant of arrest issued against a person who violated the orders of the Supreme Court. The Supreme Court on Tuesday issued notice to the Bar Council Of India (BCI) on a petition filed by two law aspirants challenging the maximum age limit of 20 years for taking admission to the 5-year integrated law degree. Keeping in view the urgency of the issue, the Supreme Court on Wednesday assured that day-to-day hearing will be held on the appeals filed by Tamil Nadu, Karnataka and Kerala against the 2007 award of the Cauvery Water Dispute Tribunal (CWDT) on sharing of water. The Supreme Court on Thursday agreed to constitute a Constitution Bench and hear petitions against tainted persons contesting elections. A three-judge bench headed by Chief Justice JS Khehar was hearing a petition filed by BJP leader Ashwini Upadhyay seeking immediate hearing of the petitions ahead of assembly elections to five states. Acting on a PIL filed by Centre for Public Interest Litigation, the Supreme Court set a deadline of June, 2017 for CBI to complete its probe by June into allegations of serious irregularities in purchase or hiring of 111 aircraft for Air India that had cost around Rs 70,000 crore during the tenure of Praful Patel as the civil aviation minister in 2005-06. A bench headed by the newly sworn in Chief Justice J S Khehar today directed the government to examine a “conflict” between the provisions of Indian Penal Code (IPC) and Protection of Children from Sexual Offences (POCSO) Act, 2012 and check if the anomaly is justified.